Two awards, including the highest recognition in the student category, were brought home by Josenian nursing students from the 8th International Conference of Nurses 2018 held at the Marco Polo Plaza last November 23. The said conference is an annual convention of nurses which is organized by the Cebu Normal University (CNU). The bet of the University of San Jose-Recoletos(USJ-R) for the Digital Poster Presentation Student Category won first place. It is a competition wherein the presenters are to visually discuss their studies through information graphics. The study which the Josenian team presented was entitled “Unfolding the Hidden Potential: Dermatoglyphics of the Fractal Dimension of Fingerprints and Palmar Patterns among Categorized Intelligence of Students”. It was authored by Mike Lawrence Carpentero (presenter), Jevon Ann Nicole Borres, Mariah Bianca Camilo, Margarita Marie Gabas, and Hazelle Marie Miyas. Moreover, it was co-authored by adviser Melvin de Castro. Mike Lawrence Carpentero pose with the plaque and certificate of recognition for winning the Digital Poster Presentation – Student category. It discussed the correlation between intelligence and the patterns on a person’s palm and sole ridges. In behalf of the research team, Carpentero received the plaque and certificate of recognition. USJ-R also bagged award for third place. It was entitled “The Untold Enigma of Handprints: Association of Dermatoglyphic Patterns of Palm and Fingerprints among Autism Spectrum Disorder Individuals through Variability Analysis”. The said paper was authored by students Xandria Maureen del Rosario, Helen Grace de la Pena, Marie Angela Cortez, Michael Andrei Cabaluna, and Jennyfe Bodin. Their co-author was also de Castro. The research talks about the significant pattern on the ridges of the palm and sole of people diagnosed with Autism Spectrum Disorder (ASD) compared to those people without the disorder. This study brings about the possible early detection of ASD on newborn children. 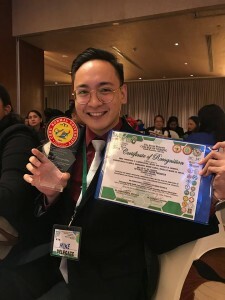 The USJ-R College of Nursing also received a plaque of recognition for co-hosting the said event along with other local and foreign universities. Similarly, on last year’s ICONs 7, the college of nursing’s research also bagged awards. The annual conference aims to provide an avenue for a scholarly forum for both professional and student nurses through the sharing of research outputs.